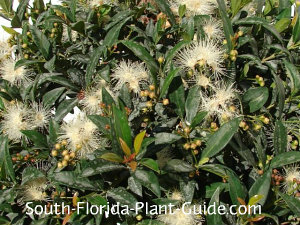 Eugenia is one of South Florida's finest hedge or privacy plants - great-looking, fast-growing, dense, and hardy. As hedge bushes go, this one is stellar for sculpting in a narrow-depth space - and shearing for a very tidy, manicured look. In other words, a neat freak's garden nirvana. It's so easy to shape that this plant is used for topiaries. Other than trimming (which is optional), this Florida native plant is one of the best low maintenance shrubs. It blossoms in spring with creamy white flowers, followed by small red berries. The berries (and sometimes the flowers) are usually removed by regular trimming. The foliage is fine-textured and new growth is an attractive reddish color. 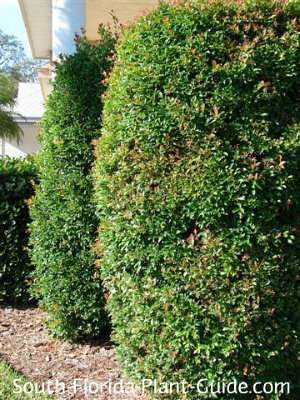 This is an excellent plant for hedging, camouflage or privacy because the foliage will grow very dense, hiding well whatever is behind it. These shrubs will grow in full sun to part shade. They're fast growers you can keep trimmed to about 5 or 6 feet. If you prefer a larger plant, let it grow tall - 12 to 15 feet or more. It's cold hardy and will do fine in Zone 9B and southward. Though it can take cooler temperatures, this plant does best and stays more full and lush in a location protected from strong winds. Choose a well-drained area. This plant's worst enemy is standing water. Add top soil or organic peat moss, combined with composted cow manure, to the planting hole. Shear with hedge trimmers fairly often to keep a manicured shape. If you let the plant grow more naturally, trim it less often and do a hard pruning in spring after the bloom cycle. Water on a regular basis but give the plant time to dry out a bit between waterings. Fertilize 3 times a year - in spring, summer and fall - with a quality granular fertilizer. Place 3 to 5 feet apart for a hedge. Come out from the house 3 feet. If you're planting along a drive or walk, come in 3 feet or more. To place this shrub near other, smaller plants, plant about 4 feet away. This shrub does fine in a large container or planter. camouflage for A/C, pool equipment, etc. COMPANION PLANT SUGGESTIONS: Juniper, Plum loropetalum, cocoplum, mid-size bougainvillea, green island ficus, drift rose, liriope or mondo grass, and cycads.